We’ve been quietly working on a new feature that integrates StockTickr with one of my favorite tools that I use every day that I trade: Trade-Ideas. It’s available now to StockTickr Pro subscribers (signup here). Here are some FAQs if you’re ready to start using it and here’s where you can configure your rules. Read on for more of an explanation. StockTickr is getting a lot more useful. In addition to the stocks that users submit to keep track of in their own watchlists, there are several lists that get programatically entered into StockTickr that you can use in your own trading. You can always track these in your RSS reader using the RSS feeds that are available for just about everything in StockTickr. For example, we’ve been entering stocks that have hit new highs (RSS) or new lows (RSS) on above average volume for some time now. It’s funny how these stocks are always popping up on the best performers list. Recently, Richard from Move the Markets has been putting several of his lists into StockTickr. His weekly Best Stocks to Day Trade (RSS) list is now in StockTickr. Also, his daily near 20 day highs (RSS) and near 20 day lows (RSS) are being added nightly as well. The High Alpha list (RSS) that Ugly likes to trade is now in StockTickr as well. As an experiment I am trying simple correlation to help bring up a list of “possible” head and shoulders patterns. I describe it in more detail in my articles Oversimplified Method for Finding Patterns in Stock Charts and Correlation Pattern Matching Explained. The process is very simple and the results are mediocre at best – I get a lot of nasty email from technicians – but very little insight about how they find them. I standard case of “I know it when I see it” syndrome. What I was trying to do is show how programs can help humans reduce their work load (looking for patterns), but generally it is still up to the humans to determine if the patterns are valid or not. My pattern matching process is written in Java, so I just used the Java mail API to construct an email with the top ten symbols (sorted by correlation) and then send them to StockTickr using the StockTickr Email API. I had not used the Java Mail API in years and had an awful time trying to connect to any of my normal emails accounts, but I finally got it working with GMail. Do you have suggestions for other lists that you’d like to see in StockTickr? Let us know or go ahead and start using the StockTickr Email API. Also, look for an announcement in the coming days about how you can seamlessly integrate these lists and any stocks in StockTickr into your trading workflow. 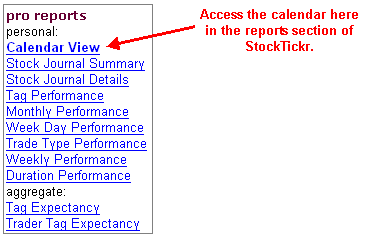 I’ve added another report that’s available to StockTickr Pro subscribers for getting the most out of their trading. It’s called Performance by Price Range and it shows how well your system performs based on the price of a stock. For example, does your system perform better with lower priced stocks or higher priced stocks? StockTickr Pro users have the ability to start their own investment club or advisory service right within StockTickr. Let’s say that I’m a super-duper stock picker and that every stock I select turns to gold (not the case for me!). Marking a trade as private prevents anyone else from seeing that trade – unless you add them as one of your “subscribers”. To do that, go to your subscribers page and add their username. Any users that you add will be able to go to http://www.stocktickr.com/private/ and see all private picks from any user that they are subscribed to. » Changing Brokers is a Pain, Right? Right? I’ve already posted some images of the calendar feature I’ve added to the StockTickr Trading Journal and I finally released it today. It’s a calendar view of your trading journal and it gives a unique view of your trading. It’s available now for all StockTickr Pro subscribers. 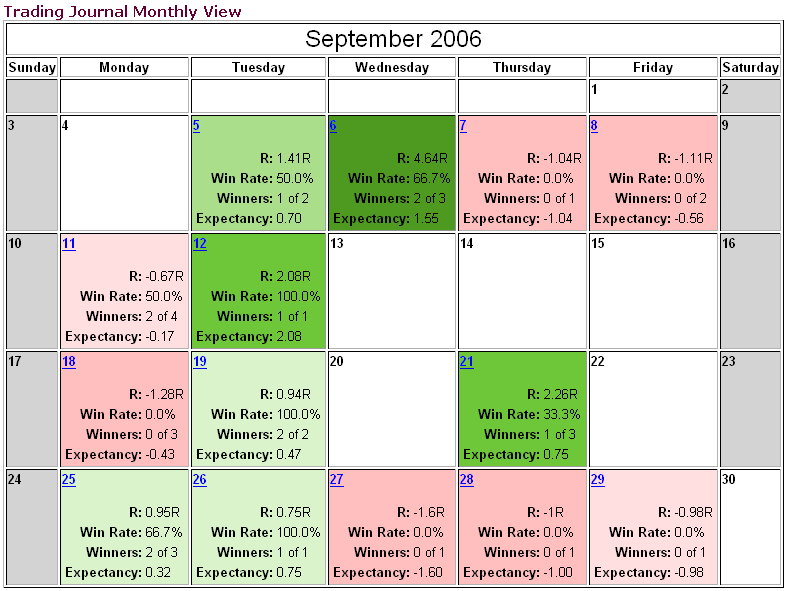 The green days show days where you made money and the red days show days where you lost money. The darker the color, the more extreme the gains or losses were compared with your largest gains or losses for the month. 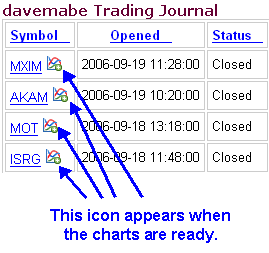 Just click on the day of the month to show the journal details of those particular trades. I’ve been using this calendar view for about a month now and it has definitely helped me keep things in perspective. For example, I remember there were a couple days where I had three losing trades in a row. At that moment, it seemed like my trading world was falling apart. During those times, looking at this calendar view allowed me to visualize the fact that my biggest winning trades are always bigger than my largest losing trades. It has helped me keep the big picture in focus even when I’m suffering through a losing trade. You can share your StockTickr Trading Calendar with the world or keep it private. Here’s a link to mine if you’re interested. We’ll be adding some more features to the calendar view soon. » Dummy Trading – “Creative” Entries? It’s too much work to do this for every trade – I had to figure out where I entered and exited and draw them on the chart. It was inconvenient to review the trades in this format – my trades were on my hard drive in a relatively inaccessible format. Sometimes I’d trade off different charts and there’s only so much room in a single screenshot. Did I mention that it’s too much work? If I didn’t remember to do the screen grabs right at the close, I was starting to just let it slide. Because of the reasons above, I wasn’t reviewing the charts like I should. The whole point of reviewing your trades is to learn from them and my solution wasn’t working. So, I decided to build a feature into StockTickr that does the heavy lifting for me. Instead of a screengrab, StockTickr generates charts for me. It’s called the StockTickr Chart Review and here’s how it works. 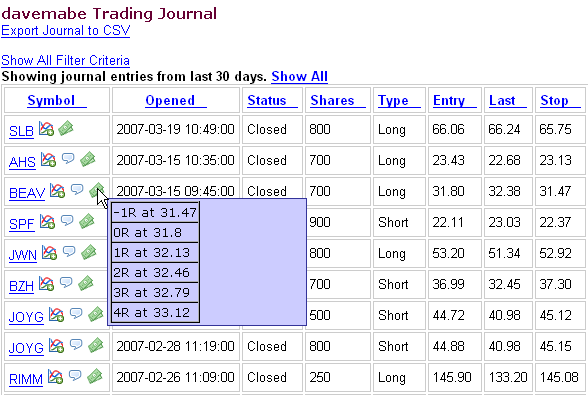 I enter a trade into the StockTickr Trading Journal like I normally do. I close out the trade and enter it into my journal (again, like I normally do). About 30 minutes after the market close, StockTickr automatically generates candlestick charts in multiple timetrames (5, 10, 15, 30 minute bars) for each of my trades that day, plotting my entry, stop, and exit. In addition to the charts for the stock I traded, StockTickr also captures the charts for QQQQ and SPY with a line indicating the time that I entered my equity trade. Here’s a trade I made in SIMG the other day, and here’s another one I made yesterday (it didn’t turn out as well). 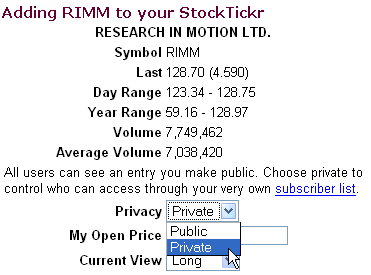 When you share your charts, they’ll show up in the StockTickr Chart Review section, where you can filter everyone’s shared charts by time frame (only show 5, 10, 15, 30 minute charts), trade type (long or short), winning or losing trades, and based on minimum or maximum R. For example, this link shows 15 minute charts for short trades that resulted in at least 1R of profit. There’s even an RSS feed for the StockTickr Chart Review if you want to follow along in your RSS reader. You can also copy the charts to your own site if you’d like to share them. You can also feel free to simply link to the chart on your own site (i.e., we’ll host the chart). This has dramatically streamlined my trade review at the end of the day because so much of the process is automated (I love automation). Because different time frames are captured, I’ve noticed some characteristics of my trades in a different time frame than I traded. Also, since much of my success depends on guessing the overall market trend during the day, the QQQQ and SPY charts help me remember what the market was doing on that particular day. Best of all, I don’t have to lift a finger – no more screengrabs! 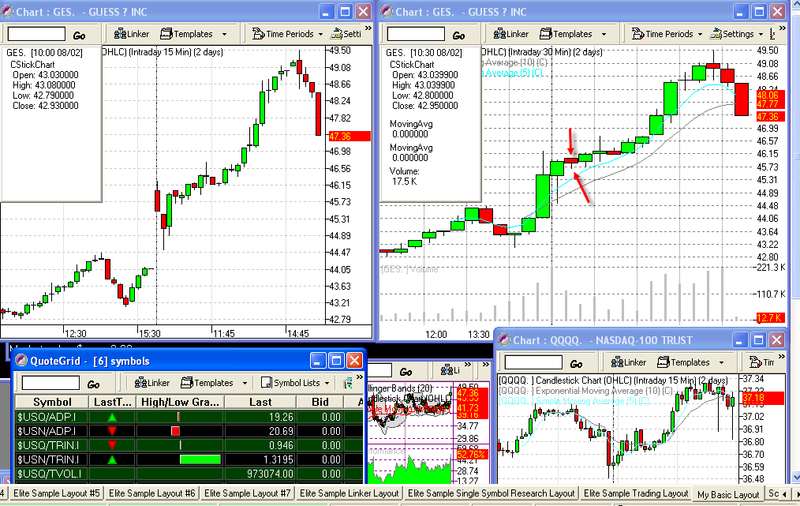 The StockTickr Chart Review is available now for StockTickr Pro subscribers. Sign up today and get copies of the TRADEthemove.com e-books on fibonacci trading. I got some feedback a few days ago from BTSTrader (his site). He had a great suggestion for the StockTickr Reports page which details the most profitable trades taken by StockTickr users in the past 14 days. The report had only open trades displayed, where a user had added a stock to their watchlist and hadn’t yet removed it. BTSTrader suggested that closed trades are more important and should be displayed by default. I agreed and just updated the report to show closed trades by default. There’s a button where you can display only open trades instead. Thanks, BTSTrader. If anyone has any other suggestions, please contact us. After I interviewed Trader-X (site) a few weeks back, I became interested in Fibonacci trading and the way he trades it. I contacted Kernan from TRADEthemove.com and got a copy of his two e-books (and subsequently interviewed him). I’ve since incorporated into my trading some of the information from his two e-books, Using Moving Averages and Fibonacci Retracements to Help Predict Price Movement, and Fibonacci and Fixed Timeframes. It’s been quite helpful in my trading which I’ll write a post about at some point. Don’t get me wrong – it’s not a magical indicator for you holy grail seekers in the crowd. However, I did find that this type of trading fit my personality quite well and is improving my win rate. I liked it so much that I contacted Kernan to see if we could run some type of promotion on StockTickr. He graciously agreed. So for the next few weeks, new StockTickr Pro subscribers will receive a copy of each of his e-books for free. Yet another reason to sign up for StockTickr Pro.